Pan Am ceased to exist 23 years ago, but the defunct airline enjoys a dedicated cult following—whose fixation with the past that doesn’t seem quite so odd when considered in light of the stinky, knee-obsessed, genital-groping present of air travel. Now, for roughly what it costs to fly to Ft. Lauderdale, you can turn back the clock. Air Hollywood is a company in LA that specializes in movie sets for airplane footage—this is where, for example, airborne scenes in Bridesmaids and The Wolf of Wall Street were filmed. It maintains multiple aircraft for film crews to use, and allows them to alter the construction of the planes in order to get just the right shot. The company also runs a number of programs out of its space, including Fearless Flight, a program designed to help people with fear of flying cope, and a similar program for autistic fliers. Your Pan Am experience starts on the main deck with a cocktail and beverage service in the First Class cabin. Each stewardess that greets you will be adorned in her original 1970’s Pan Am uniform. Our Pan Am crew will offer various video & audio selections while you sit back in your Pan Am Sleeperette seat and sip a cocktail. Soon after, you’ll climb the winding staircase where the crew will set your table for a truly memorable dining event. 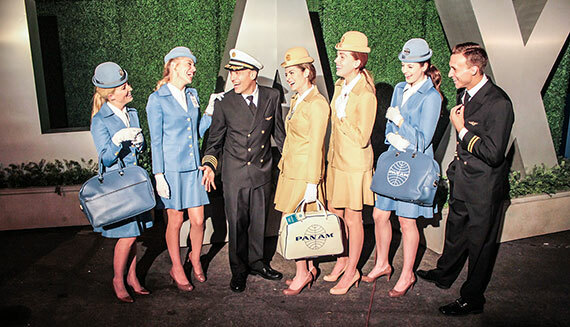 In classic Pan Am style, you’ll be offered your favorite cocktail and served a delightful gourmet meal. Everything from the china to the glassware is authentic with careful attention to the exquisite service delivery of the era and menu offerings of Pan Am. The whole thing lasts for four hours, roughly the amount of time it takes to get through security on a Saturday afternoon at O’Hare. I loved Pan Am. Also when people had respect for how they dressed on an airplane. Last time I flew there was a douche in a tank top and shorts stinking up the plane. Which makes you wonder: Is it really just the airlines that have changed, or are we, the passengers, at least a little bit to blame, too? The next flight takes off, in a manner of speaking, on October 18. Buy your tickets here.